After a year of flinging Xbox Live players into cruel spike traps, Derek Yu's Spelunky is finally coming to the PC. Spelunky, as many of you probably know, is a sadistic game that relishes death. Sure, it's characters are cute and its enemies are even cuter, but make no mistake: Spelunky (like its spiritual predecessor Spelunker) hates you, and absolutely wants to make your leisure hours as soul-crushing as those you spend behind a desk. Which is to say that Spelunky is a very old-school platforming game with unforgiving physics and randomized stages that force players to develop razor-sharp reflexes and a thick callus layer over their feelings of self-worth. This works well enough on the Xbox 360's control pad, but how will it fare against a keyboard and mouse? We'll find out on August 8, the date that Spelunky is now slated to make its PC debut. "But that's an entire month away!" you think to yourself, cursing the concept of linear time. 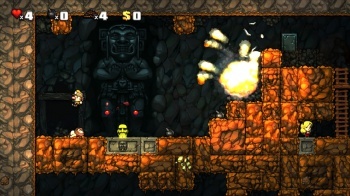 Yes, the PC release of Spelunky is a month away, but that's only this PC release of Spelunky. Before the game became an Xbox Live hit, it was already available for the PC and remains that way to this very day. The newer PC release undoubtedly has a few new features adapted from its Xbox Live Arcade analogue, but the original PC version is utterly free of charge. If you'd like a hint of what you'll be getting into come August 8, you can download the initial PC iteration of Spelunky at the game's official website.